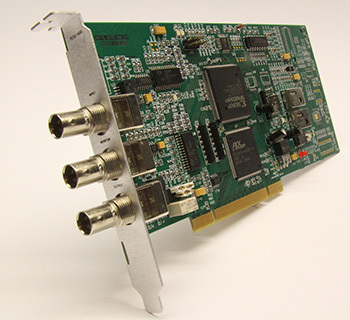 PCIU-1400 is a PCI interface card that supports packet data insertion into an incoming transport stream in either ASI or SMPTE-310M formats (auto detect). The data insertion is achieved via the PCI bus supported by complete driver APIs. It outputs both formats ASI and SMPTE-310M simultaneously with PCR Restamping. Bypass relay comes standard on all PCI boards and is format selectable in the event of power failure. PCIU-1400 is an advanced, complete hardware solution for transport streams. Insertion API offers fine level control and monitoring. Automatic detection of the input format and packet size, as well as the simultaneous ASI / SMPTE-310M outputs ensure the maximum usability and adaptability under different operation environments. PCIU-1400 is a perfect hardware choice for any types of data insertion applications. It can be used for: Emergency Data Insertion, Sub-channel Creation, Receiver Firmware Upgrade, OCAP/MHP Application Data Broadcasting, Subtitle / Teletext Insertion, Ad Insertion.